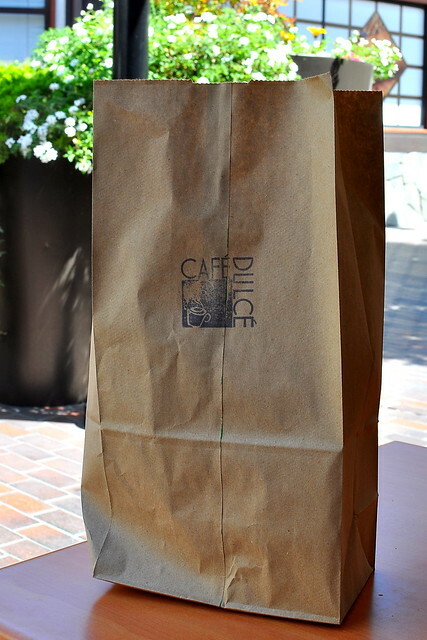 I didn’t mean to binge on doughnuts at Café Dulcé. The plan was to stop in for a single green tea doughnut, specially priced at just a dollar in celebration of the shop’s first birthday, and head to Daikokuya for ramen with family right after. My good intentions went out the window once I set foot inside the shop and caught a glimpse of the dessert-lined shelves. As my eyes wandered from row to row, one treat became two, two became three, and well, let’s just say things didn’t go exactly according to plan. Visiting a bakery on an empty stomach…dangerous. I had to try the bacon doughnut hole ($1), a three bite wonder of pillowy dough smothered in sweet icing and dotted with smoky bacon shards. 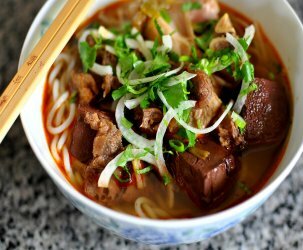 The portion was petite, while the flavor and texture were just right. 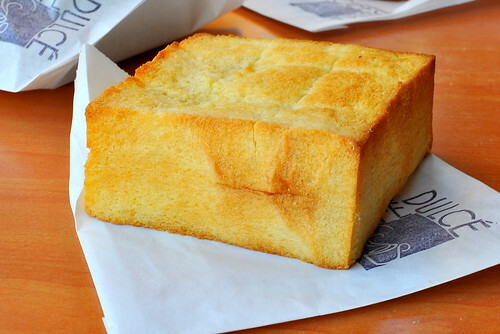 The brick toast ($3.50) called out to The Astronomer and he couldn’t resist its charms. The hefty block o’ bread was considerately sliced into nine perfectly pluckable pieces, making it easier for us to share without utensils. I couldn’t decide which bites were best, the ones with caramelized edges or the central segments of pure soft sweet dough. The spirulina churro ($1.50), a deep-fried delight with health claims to boot, was the dark horse selection. While I can’t say that the spirulina improved my health in any noticeable way, it did tinge the doughnut a most pleasing shade of green. The crisp and chewy concoction was nothing like a churro really, but still, I liked it a lot—especially the sugary coating that lingered on my fingers and lips afterward. Due to the high demand for green tea doughnuts this morning, it took 20 minutes for ours to be ready. When it finally arrived, still piping hot and freshly coated in sugar, I could not wait to dive right in. 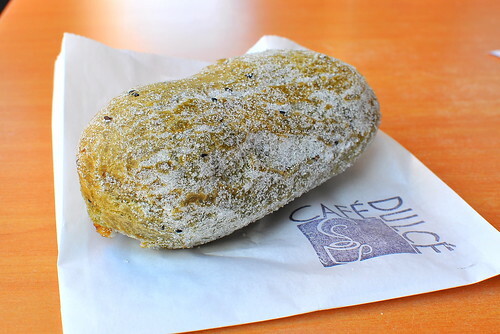 The best part of the green tea doughnut was its smooth custard filling, which was warm from the dough’s residual heat. This one went down spectacularly easy. There’s a precious small window after a doughnut is fried when the stars are aligned and the taste and texture are perfect. 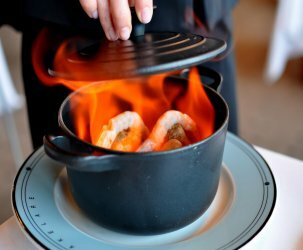 To seize the moment at Café Dulcé, come in early when everything is at its absolute freshest and fluffiest. And if a batch of green tea doughnuts happens to be coming out of the fryer while you’re there, you’d better grab a half dozen. Ah you got a fresh one?! I’ve never been so lucky there. They have a bunch of other good baked goods, and the coffee (I especially like the Dulce latte) are top notch too. Everything looks so tasty & those are my kind of prices! I made have to bite the gluten bullet and try this out. 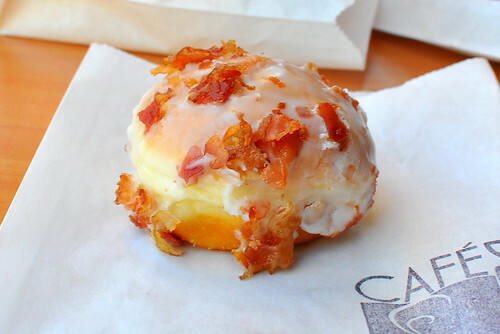 The bacon donut thing never really inspired me, though I admit it makes more sense than, say, a bacon milkshake (or a tube of bacon frosting, which I spotted in NYC Chinatown last weekend). But the green tea donut looks simply spectacular. I am so jealous of your doughnut adventures. I had my first “artisan” doughnut after a long run last Saturday morning and it was life changing. I can’t wait for this trend to hit D.C. in 3-5 years! 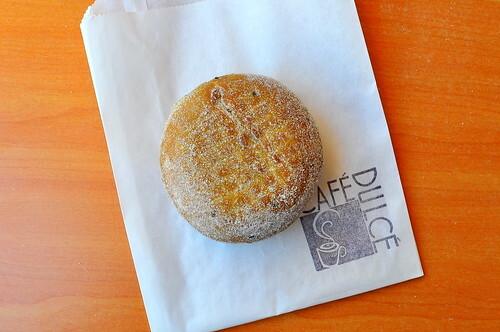 So where does Cafe Dulce stand in the LA Doughnut Power Rankings? Is it the cream of the crop? 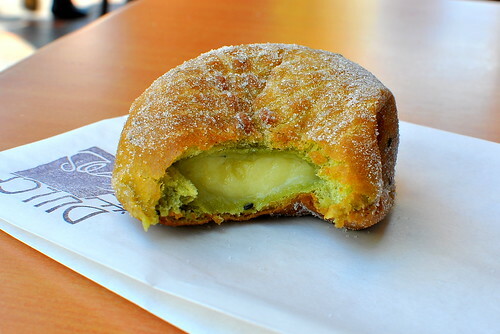 I’m not a doughnut person, but I really want to try for that custard filled green tea doughnut! Green tea doughnut, yes please! Ooh, freshly made donut… yum! 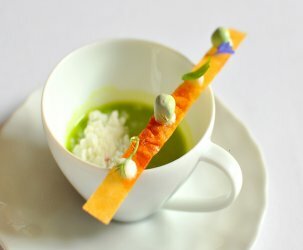 Holy green tea bag! I can’t wait to move back to LA now. Until then, I will be reaming of that custard. I will officially be your going to bakeries on empty stomach pal. The green tea donut looks amazing, along with the bacon donut. Although I’m not a huge fan of bacon, it looks so enticing. A fresh donut? Are you kidding me? That’s like a gift from the heavens. That green tea donut looks so freaking good. I’ll have to check it out the next time I head home. How funny! I JUST tried this place last Wednesday. I had the churro, too. I liked it–it was weird but good.